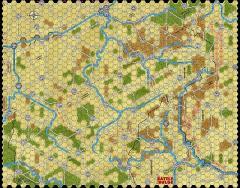 Battle of the Bulge 81 Summer 5/8 Inch Map 36x28in. Printed at 300dpi on 45lb chart paper and laminated for durability. This brilliant map brings new life to an old favorite.